Most people don’t picture trees when they think of chocolate. Yet that is exactly where cocoa beans come from. 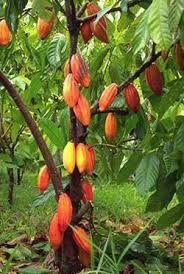 Native to the Amazon rainforest, the cacao tree thrives in warm, moist climates. Its green leaves are long and smooth to the touch. Although the leaves are uniquely flexible, bending up to 90 degrees to adjust to the sunlight, the pods produced by the trees are of higher interest to most people. The melon-sized, colorful pods protect the exquisite cocoa beans. Once removed from the pods, the cocoa beans are left to ferment for a few days. During fermentation the cocoa beans lose some of their bitterness. Each pod generally has 20 to 40 cocoa beans in it. It is important to pick the pods at the right time so it is fully ripe. After the cocoa beans have fermented, they are dried and sent to chocolate factories. One way to speed up the process is to artificially blow the beans dry. This usually lowers the quality of the chocolate, however, and is not used in making gourmet chocolates. In a sense, the beans are like nuts. They are roasted and the shells are removed. The insides, called nibs, are then ground into a fine powder. This pure chocolate substance is called chocolate liquor even though there is no alcohol in it. You shouldn’t feel too guilty after eating chocolate – it does come from trees after all.